Brian Dickinson sits across from me, sipping occasionally from a caramel latte with a contented, gentle smile and bright blue eyes. 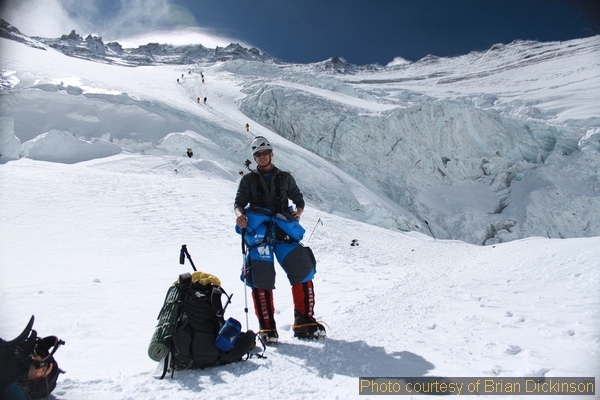 You might assume he is a typical Seattle area hiker and climber, and for the most part, he is, but he’s also been to the top of the world, the summit of Mount Everest. Not only that, he summitted solo, which he readily admits was not part of the plan. But his Everest solo climb was only a piece of his endeavor. 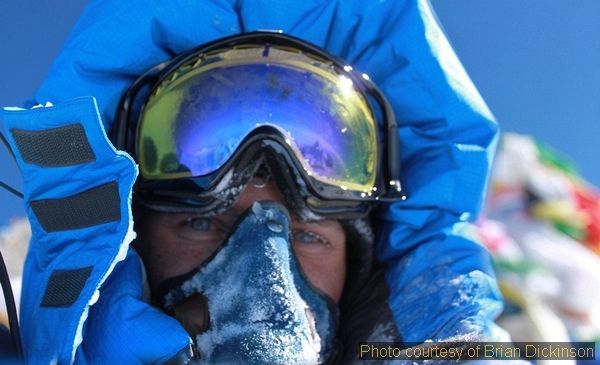 Climbing the Seven Summits, the highest peak on each of the seven continents, is only the beginning. He’s also writing a book and creating a new sort of mud race. Seattle Backpackers Magazine (SBM): How long ago did you decide you were going to climb the Seven Summits? Brian Dickinson (BD): I guess it was about 2009. I’ve always had kind of an exciting life, I was a US Navy Rescue Swimmer for a while in San Diego, but after that, when I moved here, I started by doing all the local peaks in the area, then Denali [his first of the Seven Summits]. But we got stopped short on Denali due to weather. I got 1000 feet from the top, but 60 mph winds pushed us back, a couple people got blown off the top of mountain, so it was a good day to turn around. We were pinned down at high camp for about a week. SBM: And that kind of weather is pretty typical on Denali, right? BD: It’s often severe. But Denali is definitely my nemesis mountain. I went back this year and tried again with a split board [a snowboard that splits in half, fitted with skins] and for whatever reason it burned my feet, but with the weight required to climb Denali, about 60 pounds in a pack then at least another 60 in the sled, we went up to about 14,500 feet in a couple of days. So we were moving quick, but talked to the medics and they advised me to head out, so I did. It ended up being a blessing in disguise, because a couple days later there was an avalanche that took out about four Japanese climbers. So I went to Kilimanjaro and climbed it in four days. But I heard there were a lot of kids in need there, so I brought a bunch of toys and gifts and went to an orphanage and distributed the toys to them and realized that this was my purpose. So everywhere I’ve gone after that, I’ve visited orphanages in the area. Then after that, I climbed Elbrus in Russia. I actually had my wife and a couple of friends join me at base camp. We were a bit terrified by the corruption in Russia when we dealt with the orphanage, but I did a climb of Elbrus, and then headed to Everest. SBM: A lot of people don’t understand that thing which drives climbers to drag 80 pounds up to the top of a mountain, through treacherous conditions, even face death in order to climb. Can you explain what drives you? 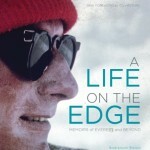 BD: I think people who are further away from climbing, like the media, they like to project death and all the negative bits, but if you are close to it, if you are doing it and are a climber, you are doing it for a reason. I climb because I’m very goal oriented and find the mountains bring something that can’t be found elsewhere; the beauty and serenity away from normal chaotic life. You have to be strong physically, mentally and spiritually to succeed. Each mountain is a different challenge, which requires different planning, training and execution. So you have to find your reason. It’s an individual choice each time and you just have to figure that part out. It’s what drives you. When I go into it, I don’t think that I’m going to die. There are risks in everything, but we take calculated risks in climbing. 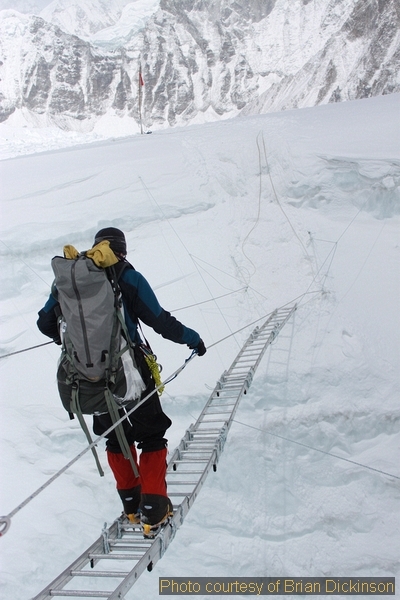 One of our choices on Everest was to travel as a small independent team instead of with a large group. There were the two of us climbers, both from Snoqualmie, and we each had a climbing Sherpa, a couple cooks and porters. 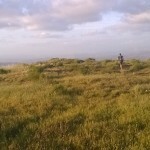 SBM: How many of you got up to the actual summit? SBM: There’s a story in that answer. When did the others turn around? BD: Dennis, the other climber from Snoqualmie was a day behind me with his own Sherpa. He was sick for a portion of the expedition, and we were at Camp II on our summit push, so we had a discussion and he stayed there for another day, while I headed up. But when I went up, I dropped my goggles somewhere above Camp III, so they cracked and frost was working its way between the layers. I was climbing up the Lhotse face, which is not a place to troubleshoot goggles. So I got up that and ripped the inner layer of the goggles out. Unfortunately, that effectively cut my goggles in half because of the crack, which allowed frost to get inside them on the climb the next day. We headed up the next day and I got to the Balcony pretty quickly, but Pasang, my Sherpa climbing partner got sick. He made it to the Balcony, which is about 28,000 feet, but he was vomiting, so he told me he was going to turn around and wait for me. We had a conversation and I asked him if he could get to the Balcony alone, and he said he could, and that he would wait at the Balcony for me. He placed another bottle of oxygen where we were at that spot, and gave me his radio, then he headed down and I headed up. What happened next was a little unusual. I was the only person on the mountain above the Death Zone [26,000 feet] that day. There was no one from either the north or south side, so it really was a solo summit [29,035 feet], and then a blind descent. SBM: God, I hope you got a picture of yourself up there, because that’s the only way Nepal will recognize that you summitted! BD: I know, it’s crazy! I pulled my camera out and it was freezing up as I took photos with it, but I got them. I did go snowblind on the way down due to the goggles, but got the photos, and when I returned to Pasang, I gave him my camera since I couldn’t see, and he looked through them and confirmed that I did have photos of myself at the summit. So I sent them to Elizabeth Hawley [the unofficial, official verification expert on Everest Summiters, who keeps the Himalayan Database of records]. 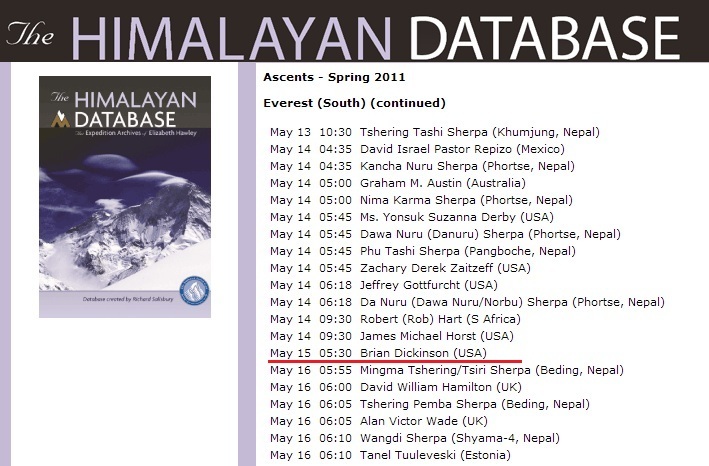 And it’s in the official Everest record as a solo summit on May 15, 2011. BD: So I got up to the south summit, and you know, there’s that two mile drop on each side of the cornice traverse, then made it across the Hillary Step and there it was. And it was a crazy experience because you work so hard for something, but then you’re alone and you never know how you’re going to respond, you know. The true summit is a small point that can only fit a few people and is covered in prayer flags. As I took my final steps to the top, tears of joy streamed down my face as the entire journey flashed through my mind (physical, mental and emotional preparation, saying goodbye to my kids, JoAnna running through the airport to give me one last kiss, visiting the Kathmandu orphanage, my early headaches / forehead swelling, my successful climb of Island Peak, the many trips up and down the mountain and through the Khumbu Ice Fall and all the emotional times of isolation being away from the family). And then I was there. I was on top of the world. At that very moment I was physically higher than any person on earth. 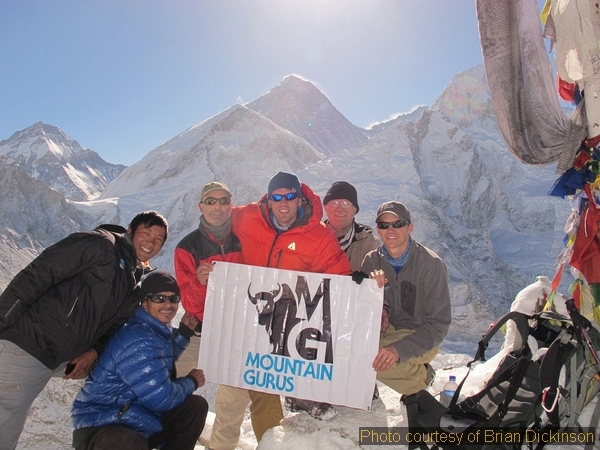 I sat down and made the following radio call: “Calling all Mountain Guru camps, this is Brian checking in from the summit of Mount Everest!” A roar of excitement and congratulations came across from all camps. I stayed on the summit for over an hour exploring around since I knew I’d probably never be back. BD: On the way down, a descent that should have taken three hours, took seven. I was totally snow blind, so I was hand over hand in the descent. It took a month and a half for my left eye to come back and two days for my right. SBM: Was it worth it? BD: I… you know, I would not wish that on anyone, because I don’t know anyone who has survived something like that. But I guess I have a strong will to survive and I didn’t panic and just felt a miracle up there. I was never alone, I had a presence. But the impact that it has had on other people, I think, is the purpose. I’ve read a lot and talked to other people who have had different death-defying survival experiences, and you have survivor’s remorse. I mean, I’m as flawed as anyone; why was I spared. But maybe talking to people and telling the story is the purpose. On one hand I would never want to go through it again, but on the other hand there is a reason that it happened. SBM: You must have a wonderfully supportive wife. BD: Yeah, I don’t know what her problem is (chuckles). No, she is. She’s a counselor and she’s just amazing. SBM: Do your kids understand all this? BD: They have not heard the whole story. Whenever they join us for one of my public talks, my wife takes them out of the room for the scary part of the story. But I also tailor the story for the younger audiences. 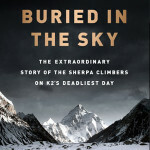 I don’t want my kids to be scared when I go somewhere else, based on my Everest story. SBM: How do you come to grips with the fact that there is a chance that you could leave your family behind by attempting the endeavors that you are undertaking? BD: I’m a man of faith, so I always hold that strong, and I’ve been trained more than most people. I’ve been through some of the hardest training in the military, I’ve seen what my limitations are, and I know how far I can push beyond them. But there’s a point where I have to take a step back and know right from wrong. I asked him why he didn’t cancel on me, and his response showed both his deep devotion to his family and his dedication to his endeavors. The interview obviously went on. BD: But yeah, it definitely goes through my mind. A lot of it is faith, but a lot of it is also making wise decisions. BD: I went to Antarctica and summitted Vinson. That was last November. It was extreme -70 degrees and beautiful. SBM: Cold doesn’t bother you, then? BD: Well, yeah, it’s cold, but you deal. I had a full down suit, you know, I hung out with Dave Hahn [Rainier Mountaineering Inc. Guide, also from Seattle] at Camp I for a while, ran into Eric Larsen [Polar Explorer] while he was down there. SBM: So, you are off to South America next? BD: Yeah, I’m doing Aconcagua February 2. My wife is bringing the kids to Argentina to meet me after I climb and we’ll all visit the orphanage together. And I’ve always wanted to finish in Australia with Kosciuszko so my family can climb it with me. I’ll loop back around at some point and hit Denali again, too. SBM: Okay, let’s switch gears a bit into your other endeavors that revolve around this. You are writing a book? BD: Yeah, Climbing Magazine did a full workup on me while I was doing my Everest trip and let me blog and I am turning that into a book, it covers my military training and some other stuff, but mostly it’s about my Everest climb. Its working title is currently “Blind Faith” and it’s with the editors now. Also a major film studio has approached us, they want to make a movie, but I am wary. BD: Um, Hollywood. You know, they turn things into things that aren’t. At least with the book I can tell the whole story and tell the truth. SBM: That’s a really hard thing to do because everyone is competing for the train wreck story that is going to make the most people watch. BD: Yeah, it’s important for me not to do that. I just want the story the way it is. So if the movie doesn’t happen, that’s fine, I guess. SBM: And most recently, founded a new mud race with a twist. What’s the plan? Mud runs have become ultra popular and they are getting more and more so. People are bored of regular races, and individual training is no fun, people get hurt just training for the marathon or whatever. In seeing that and knowing my skill set, I know I can always do better and that inspired me. I looked around, and mud races are all the same. So I came up with a vision of having a theme based race. So it’s the Seven Summits in a race: Seven miles transformed into Seven Summits. It’s basically what Disney did for theme parks. One mile you’re going through Africa and it emulates that, one mile is Antarctica, each has its own challenges. So we’re kicking it off in Seattle on June 22. SBM: You’re starting in Seattle because that’s home, how did you pick other locations? BD: The other piece of this is the Navy SEAL intensity, so I’ve worked a lot with Navy SEALS and Navy Rescue Swimmers and have a lot of friends who’ve helped me select locations. We’re getting lots of feedback that more locations are needed, so in 2014 we’ll probably scatter and go up into Canada and such. SBM: Thank you so much for taking the time with us. 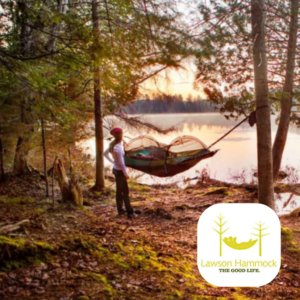 Good luck on your book, the race and Aconcagua in a couple weeks! You can follow the rest of Brian’s Seven Summit climbs on his blog and register for his Seven Summits themed mudrace at 7 Summits Race.